Team spirit, individualism, non-conformism and liberalism are the main caracteristics of Aquarians. They are also altruistic, they like new technologies but their are also versatile and inconsistent. They have a sense of brotherhood and do a lot for their community. Their ideas are progressist, revolutionarian and sometimes excentric but always looking towards new technologies. In their private life they focus on friendship and freedom. Keywords: Independent, humanist, original, creative, genius, rebellious, eccentric, intuition, altruism, sociability, versatility. 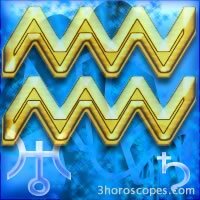 Aquarius corresponds with ankles and nervous system. Polarity: Masculine, element: Air, modality: Fixed. How many planets do i have in Aquarius ?